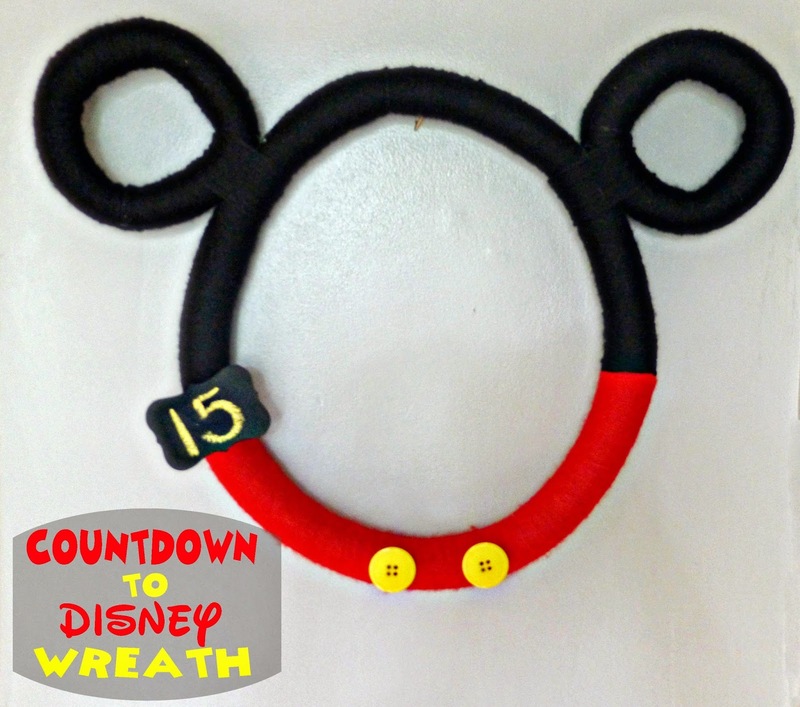 We are taking the girls to Disney this fall, and I thought it would be fun to make a Countdown to Disney Yarn Wreath so they could get excited about the trip a little every day leading up to our departure. Since it's going to be a one time use kind of craft, I didn't want to spend a lot of money. The circular craft wreaths were running over $5 at the craft store for the large ones and the smaller ones were around $4 each. I really didn't want to spend more than $10 on all the supplies, but thanks to Pinterest, this nifty idea helped keep the cost to under $5, which included all the yarn and supplies. Simply pick up some of this foam pipe insulation at the local hardware store (mine only cost 98¢), wrap it in a circle to the size you want your wreath, then hold it together with some duct tape. I picked up some red and black yarn for a little over $1 each at Michael's, as well as a wooden cut out piece. 2 yellow buttons were under $1. Wrap the bottom half of your wreath with the red yarn, securing ends with a little hot glue. (TIP! Do not put hot glue on the foam. It will melt it! Instead, place more duct tape where you want to glue, and glue to that!) Repeat with the black yarn for the top half. Wrap your smaller circles (for the ears) in black yarn, then attach them to the bigger circle with more more black yarn, followed by a dab of hot glue to secure. Glue on 2 buttons at the base of the wreath. I painted my wooden piece with a little chalkboard paint and secured it with some hot glue. Then my wreath was complete. Oh such a cute idea!! Lil Pumpkin is, of course, into Disney Princesses, and her current fave is Elsa hehe. Have a lovely time!! :) 15 days will fly past! It's going to be more than 15 days, since we aren't going until October. I just wanted a more rounded number for the picture lol. Elsa really is a hit with the little girls! That's Allison's favorite right now too! Hey! That looks great, Theresa. You're so creative. That is such a cute idea. We just got back from Disney a week ago and I already want to go back. I know! I have been really getting excited about our trip through your Instagram and Facebook posts Robin! Even Jason looked at a few and got excited too! My Favorite Disney Film? The Avengers. So is the Muppets. My girls really had no idea until about a week ago. That looks easy enough for all the Disney lovers out there. Cute! You always come up with the best ideas. I like it!! One way to keep them excited. I love your mickey wreath. Pure genius. I am busy packing cuz I am coming with you!!!! My favorite thing about Disneyland is the ambiance; the sounds, the smells, the climate and the mood. It takes you away into a world of its own and you escape in a 3-D version of yourself. Haven't been since 2007 and we were planning a trip in May of this year but dear bc and chemo had other ideas. Just yesterday my sweet man was saying we need to go as soon as we can in the fall when I'm done with radiation. Yuppers. We need to be there again! There are so many Disney films I like. Let me settle on Pirates of the Caribbean (every one of them). 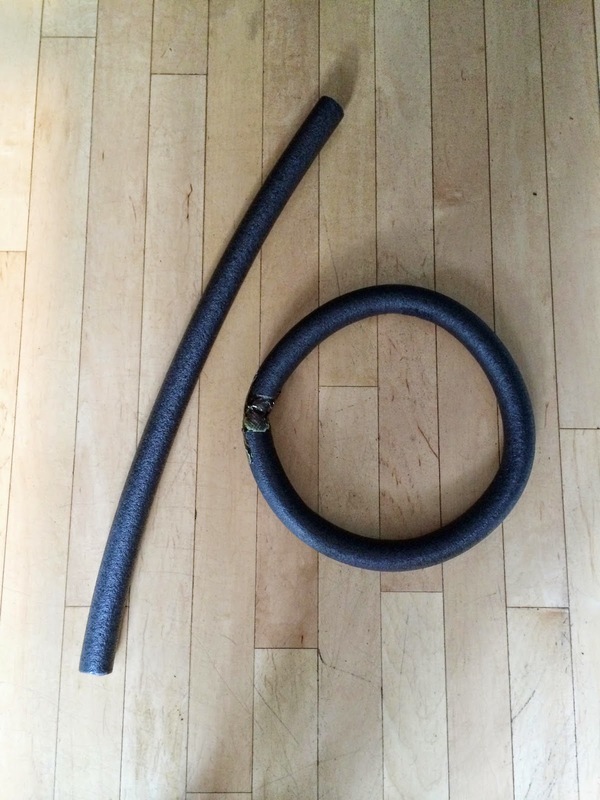 I love your tip about using the foam pipe. I have some left over from last winter that will make an excellent wreath. So cute! What a fun idea!!! I can't choose my favorite Disney film. My son's is Lion King though. Hands down! Aww that wreath is so adorable! I loved my trip to Disney world and I can't wait to be able to take my son there! What an adorable idea. I know several Mickey friends who would love it. What a super cute idea. We are going in OCtober, I better get started! This is such a cute idea. I will have to remember this when we have a Disney trip. omg how adorable this is! i heart mickey anything and everything but this is over the top cute! What an adorable idea! I'll have to keep this in mind if we do a Disney trip. I think the Pirates of the Caribbean ride is my favorite. I get a kick out of it every time. The Haunted Manson is my favorite ride, but really, I just enjoy the entire park. Frontier Land is my favorite section of the park. Cute! I should make something similar for our trip this November. That's a really cute project. My niece would love to make that. I'll have to do it with her. That is so cute! My favorite thing about Disney is the castles. I have not been to Disney since i was a little girl. I was to young to remember the trip which is so unfortunate because i can imagine it was a great experience. I would love to go now that i am a adult and could remember the amazing time. This is a very exciting way to prep for a vacation!! I would love to make one for our family. What a super cute idea! I bet your family is so excited to go to Disneyland! Now that looks like an easy project I can do! This is amazing! It looks easy and turned out great. Too stinking cute! I love it! that is so precious. I know little kids would love counting down the days with your wreath. This is adorable! I would love to make one with my kiddos! This is fantastic! We are headed to Disney in October but this time we are surprising the kids and telling them the day we leave!! That craft is very cute.